The general situation across Europe shows a dipole pattern with a powerful upper ridge across northeastern Europe and northwestern Russia while deep troughs and cyclones are expected over the northern Atlantic ocean. Such pattern will develop a late “heat wave”, a period of very warm weather across a large part of Europe through this week. An intense pressure and temperature gradient across western Europe will result in very dynamic weather – deep cyclones will affect British Isles and Ireland, where at least one severe windstorm is becoming increasingly likely on Friday. The pattern on Friday reveals an intense ridge over NE Europe with a very deep cyclone (even below 950 mbar) over the northern Atlantic, centered west of British Isles. The cyclone develops on Thursday afternoon and rapidly deepens overnight, moving towards Ireland on Friday morning. 3-hour sequence of the cyclone’s path from Thursday evening until Friday morning. High resolution models even indicate the possibility of a sting-jet developing overnight. Such a jet could bring potentially devastating winds with extremely severe gusts in excess of 180 km/h locally. Peak wind gusts swaths based on ARPEGE and ICON-EU models – both indicate the potential for severe windstorm development towards Ireland on Friday. ARPEGE is the most aggressive at the moment, but agreement of both global (GFS, ECMWF) models and high-resolution models is fairly good. For comparison, here is the ECMWF model guidance for 850 mb sustained winds at Friday 00 UTC – the location of the cyclone’s centre is quite similar to the high resolution models, despite the event still being 4 days away. 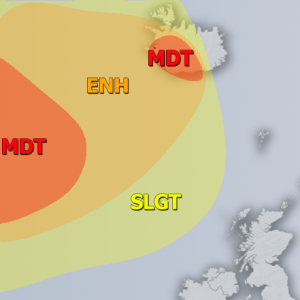 The potential is increasing for a severe windstorm to develop late this week across western Europe, especially across Ireland and partly also western Scotland. The development of sting-jet is possible and therefore damaging wind potential is enhanced. We are monitoring the evolution of the pattern this, so we will have more updates soon – stay tuned!